The Blog of CF Photography: SOME THING SILLY, OR COOL? SOME THING SILLY, OR COOL? So there I was. Venice, Italy 2002 on a vaporetto, that's Italian for water bus, and I see this in front of me. Wow, what were they thinking. 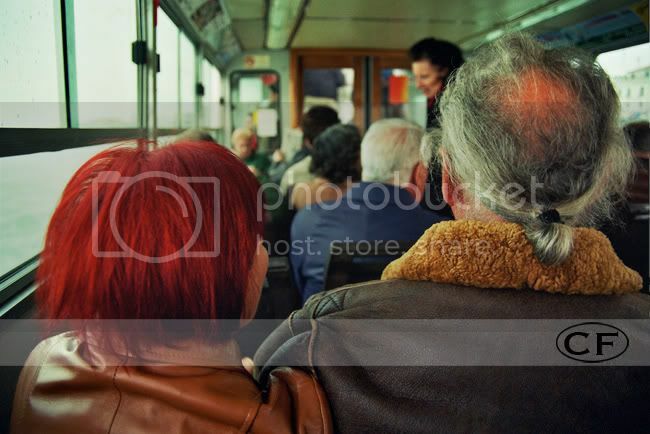 An aging Italian hippy and his wife who dipped in the red dye a bit to many times. I thought this was wild and had to grab a shot. Kari was a bit worried they would see me taking the shot but as you can tell I made it home with the film and camera in tack. Now the hard part. Is it silly or cool? I'm not really a fashion guru but I thinking that this is not the best look for most people and not what I would call an appropriate look for some one of there age. Or does it matter? I have to say that with each year gone by, that I wish I had my 20's back and I'm listening to younger music and trying to, in general, be cool. Maybe they have the right idea and are just being them self. The self that they have always been. One more point, if it wasn't for them my ride on that vaporetto would have been dull. Thank you crazy, cool older Italian couple.